WikiLeaks founder Julian Assange was arrested Thursday at the Ecuadorian Embassy in London after Ecuador withdrew its offer of asylum, according to the Metropolitan Police, who later confirmed that his arrest was under a U.S. extradition warrant. Details: The Justice Department charged Assange with "a federal charge of conspiracy to commit computer intrusion for agreeing to break a password to a classified U.S. government computer," per its press release announcing the indictment. The charge, which carries a maximum sentence of five years, alleges that Assange conspired with Chelsea Manning in 2010 to crack a password on Defense Department computers. After being taken from the Ecuadorian Embassy, Assange was found guilty by a U.K. court of breaching his bail conditions in 2012. A British judge called Assange, who faces a maximum of 12 months in prison, a "narcissist who cannot get beyond his own selfish interest." He has been ordered to appear back in court on May 2. "It is bitterly disappointing that a country would allow someone to whom it has extended citizenship and asylum to be arrested in its embassy. First and foremost, we hope that the U.K. will now give Mr. Assange access to proper health care, which he has been denied for seven years. Once his health care needs have been addressed, the U.K. courts will need to resolve what appears to be an unprecedented effort by the United States to extradite a foreign journalist to face criminal charges for publishing truthful information." Our thought bubble, via Axios' Joe Uchill: What's interesting is that the charges focus on Assange technically assisting Manning's hacking, making the charges more about Assange the hacker than Assange the journalist. It quashes some of the concerns about this being a crackdown on the free press. Axios speculated this would be the case in November. 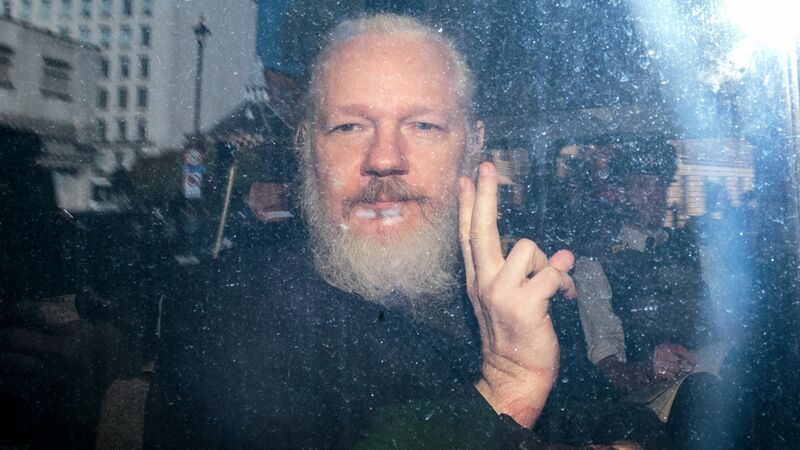 The big picture: Assange had been in the embassy since 2012 after being released on bail in the U.K. over sexual assault allegations in Sweden. He claimed that he could be extradited to the U.S. to face prosecution for his work with WikiLeaks if he returned to Sweden to face those charges. Last year, a mistakenly redacted Justice Department filing showed that federal prosecutors had prepped an indictment against him.